This easy paleo almond flax keto bread recipe stands on it's own with a wonderfully dynamic flavor and texture. The crunchy crust and soft savory inside pair perfectly with a nice slab of salty butter. This easy paleo almond flax keto bread recipe stands on it’s own with a wonderfully dynamic flavor and texture. The crunchy crust and soft savory inside pair perfectly with a nice slab of salty butter. Jennifer McGruther, the real food blogger behind The Nourished Kitchen, is a talent when it comes to traditional real food. She graciously allowed me to share this almond flax bread recipe from her ebook The Nourished Kitchen Guide to Grain-Free Baking. Unfortunately, that book is no longer available, but if you like her recipes, I would definitely recommend grabbing a copy of her print book The Nourished Kitchen: Farm-to-Table Recipes for the Traditional Foods Lifestyle. 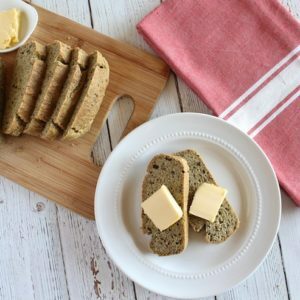 If you want to check out even more awesome grain-free bread recipes, see my post on the top 10 grain-free bread recipes! Many paleo or keto bread recipes make the mistake of using too many eggs which results in an overly eggy flavor, but not this one! The flavor and texture are hearty, but not too heavy or eggy. This bread stands on it’s own with a wonderfully dynamic, unique and even flavor.. The crunchy crust has a hint of sweetness (if you use honey) yet the bread works as a savory or sweet treat. 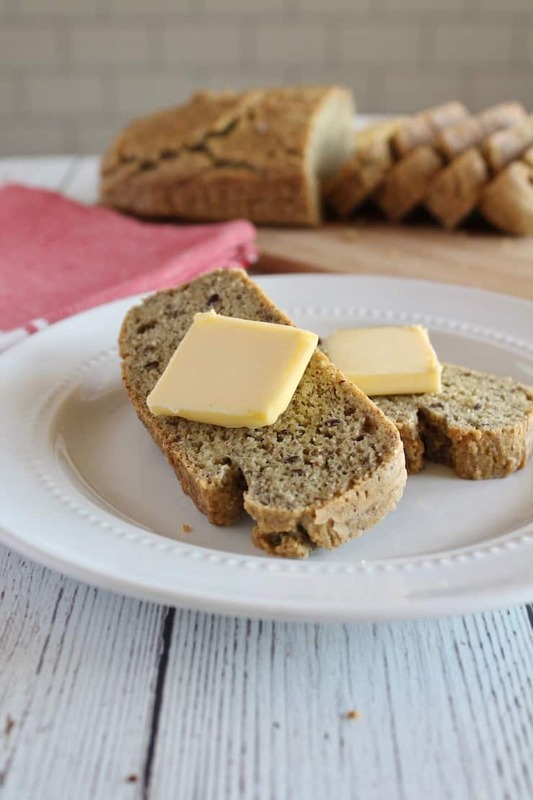 This almond flax keto bread recipe benefits from the addition of ground flax seeds which help to not only improve its texture, but also improve its color and consistency. The whole flax seeds are added for texture. A slice of this bread tastes even more amazing crisped up fresh out of the toaster slathered with butter or quick homemade chia strawberry jam. This bread will last for about a week to a week and a half in the refrigerator. It will last longer sealed in a bag in the freezer. I haven’t tested this yet, but I would imagine it would keep in the freezer for a month or more. We usually eat it all up before we have a chance to store it! The addition of honey is optional. It just adds a tiny touch of sweetness. If you are keto, you will want to omit the honey. The batter may seem thick when you are done, but this is normal. Resist the urge to add more liquid which will affect the texture. The bread comes out best using large eggs. If you only have small or medium, the bread will still turn out ok, but may be a bit more dense. You can also add an extra egg, but this may change the bread’s flavor. 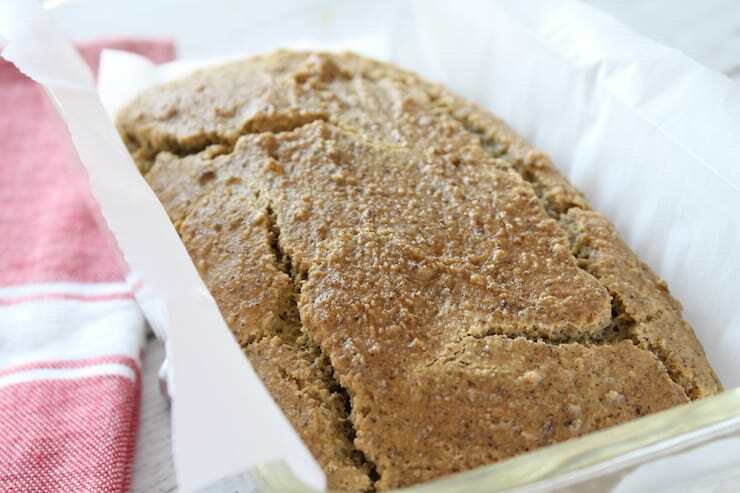 Since this is a quick bread that is yeast-free and paleo, it won’t rise very much (just a bit), but the flavor and texture are still incredible! This is not a traditional sandwich bread recipe, but more of a snacky bread. You can still make smaller open-faced sandwiches topped with homemade mayo and turkey or avocado. Or you can enjoy it with butter and jam along with a cup of tea. The apple cider vinegar combines with the baking soda to help this bread be a bit more airy and fluffy. It is a small amount and does not affect the flavor. If you aren’t a big fan of the flavor of flax seeds, try using fresh golden flax seeds instead of regular brown flax seeds. Golden flax seeds have a lighter flavor. Also, flax seeds can go bad and develop a funky smell after a while, so using whole flax seeds that you’ve ground yourself (in a coffee grinder) will be best. Pre-heat the oven to 300°. 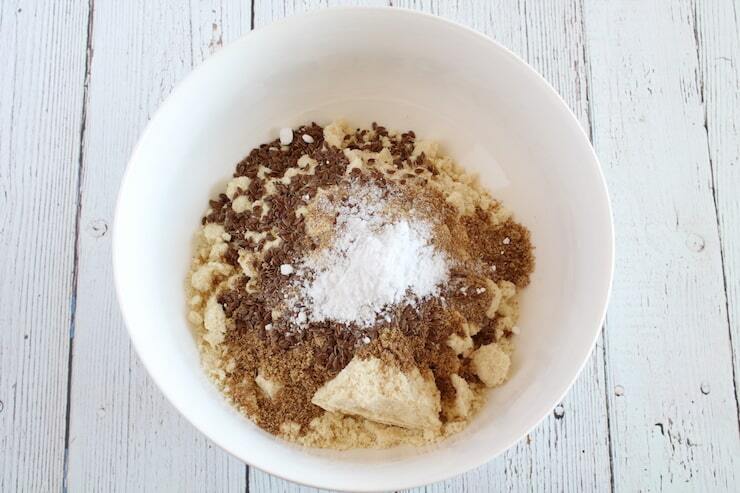 Combine all of the dry ingredients in a mixing bowl or food processor. Add the eggs and apple cider vinegar and mix thoroughly. 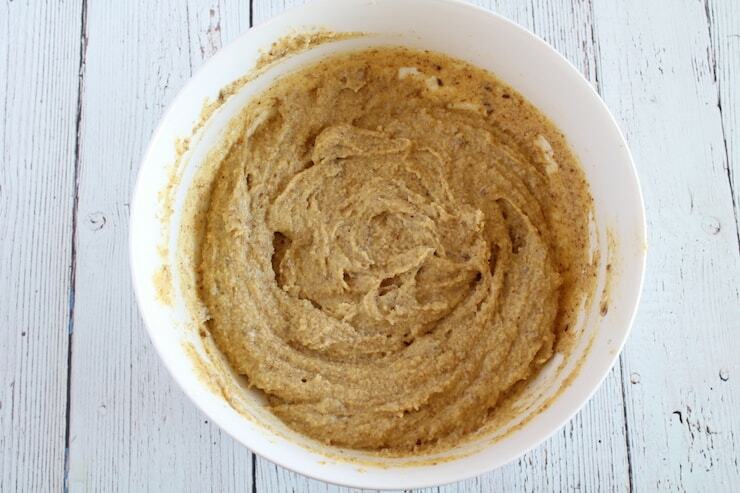 To best get the lumps out of the dough use a food processor, electric mixer or hand blender. Use an 8 or 9 inch loaf pan and either grease it with butter or line it with parchment paper to prevent sticking. 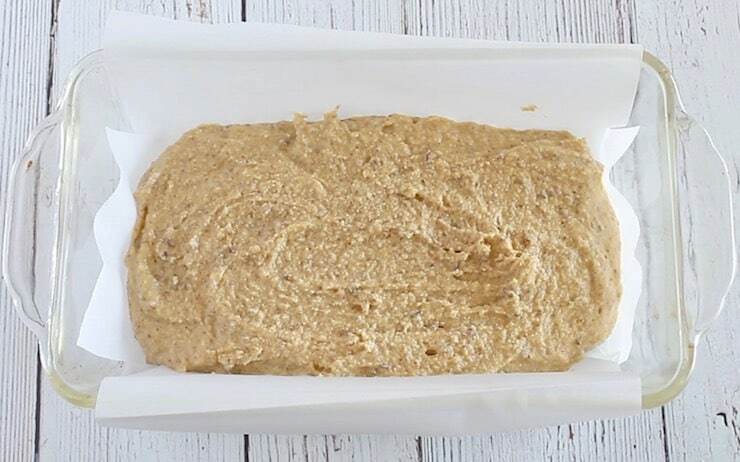 Pour the dough into the loaf pan. Bake for 45 minutes, then let cool. Slice up and serve with butter, nut butter or any toppings you desire! Did you like Easy Almond Flax Keto Bread Recipe with Crunchy Crust! (Paleo & GF)? Don’t forget to rate the recipe and leave me a comment below. You can also follow me on Facebook, Instagram, Pinterest! Mix all ingredients together (except for the butter--which is used to grease the pan) until thoroughly combined. Grease an 8 or 9 inch loaf pan or just line it with parchment paper instead. Pour dough into the loaf pan and bake at 300° for 45 minutes, or until a toothpick inserted into the bread’s center comes out clean. The batter may seem thick when you are done, but this is normal. Resist the urge to add more liquid which will affect the texture. The bread comes out best using large eggs. If you only have small or medium, the bread will still turn out ok, but may be a bit more dense. You can also add an extra egg, but this may change the bread's flavor. 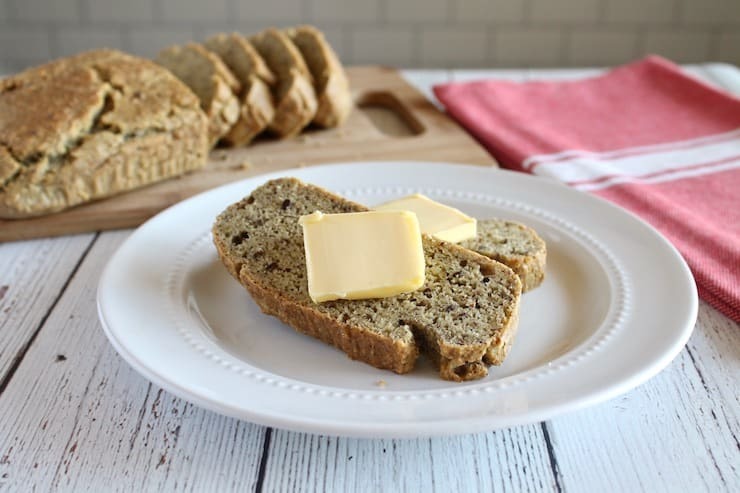 Since this is a quick bread that is yeast-free and paleo, it won't rise very much (just a bit), but the flavor and texture are still incredible! If you aren't a big fan of the flavor of flax seeds, try using fresh golden flax seeds instead of regular brown flax seeds. Golden flax seeds have a lighter flavor. Also, flax seeds can go bad and develop a funky smell after a while, so using whole flax seeds that you've ground yourself (in a coffee grinder) will be best. The nutrition facts below are for bread made without honey (keto version). This Easy Almond Flax Keto Bread Recipe post was originally published in February of 2013, but has been republished in September of 2018 to include improved recipe notes, a new recipe video and new photos. Original recipe by Jennifer McGruther, photos by Hannah Healy. Why do you include the whole flax seeds? I’ve heard that your body is only able to fully absorb the nutrients from flax seeds when they are ground. So wouldn’t this be a waste? Or perhaps it’s only added for the texture. Just wondering. The recipe is actually from Nourished Traditions Grain Free Guide, so I didn’t create the recipe. I would guess that she included them for texture. 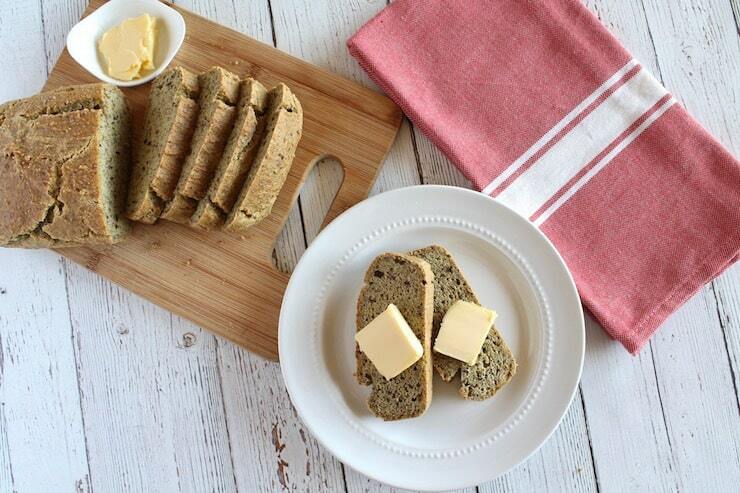 There are ground flax seeds in the bread, so you do still get the benefits of the flax seeds! Can I ask in the recipe is it 300 Celsius or Fahrenheit? I will try this bread next. I’ve tried the Wheat Belly basic bread which was hideous – smells and tastes like fart – and I made Lillian’s Kitchen basic bread last night and I actually enjoyed it better today than last night and it’s vastly better than Wheat Belly. Hers uses almond butter and only a little flour. This one is similar to Wheat Belly but with one less egg and the addition of the vinegar. I am keen to see what that does. Thank you for sharing, I love Nourished Kitchen (found you on Pinterest). I’m very pleased to find this as it’s new to me too. will be trying this flaxbread, but, wondering whether it’ll be a bit cake-like ? with all the eggs & honey? Melanie, how do you know what fart tastes like? Just wondering…..
90% of taste is in the smell, it’s why you know if you like something even before it hits the lips, I just found this site, now I gotta go make this bread. What size pan? How many servings? Do you have the nutrition information? I need this information due to the health problems I have… including diabetes. Thanks! I was really looking forward to trying this recipe. I baked up a loaf this morning, but the flax seed I used lent a rather fishy flavor to the bread!? I had to grind the seed myself, it could’ve been old seeds. Any suggestions or alternatives to flax seed? The texture is lovely though! I will try the recipe again. Try golden flax seeds, they have a lighter flavor. Hi there! I only had golden flaxseeds on hand, no baking soda so I used baking powder, substituted only 1 teaspoon of liquid stevia for the honey due to low carb requirements, and only had on hand almond meal, not almond flour, so that’s what I used. It was delicious! Thank you so much for posting this recipe!!! Brilliant! I used chia seeds instead of the teaspoon flax seeds (i still used the flax meal) and its delicious! This was good! For some reason mine isn’t sticking together too well when I slice it. I have heard that the size of your eggs really matters in wheat free cooking. So if the recipe calls for 4 large eggs and you only have medium, 5 eggs will be needed. Perhaps that’s a help to you? I’d like to try this bread but would appreciate knowing what size loaf pan to use. Thanks! Would this recipe work with almond meal instead or blanched almond flour? I only have almond meal at hand and I’d hate to go to the store for just one items. Thanks! OK, I tried it with almond meal, and I was very pleased with the texture. Now, I am very new to Paleo technically this is my first week, so the whole no grain/GF baking is foreign to me, so please understand my next question comes from a place of ignorance, is this bread supposed to taste like paper? Is no taste something I need to get used to, or is this bread just “plain/bland” as far as flavors go? I’m only a couple of weeks into wheat free and yo are lucky you’re tasting paper my first loaves tasted like fart! Lol, I think the darker flaxseed had something to do with that. Melany, thanks for your insight! I wonder if adding spices like cinnamon, all spice, nutmeg, etc would help, I might try adding pure maple syrup too. I’m determined to make this work! 🙂 P.S. I made chocolate cupcakes before and after one bite I threw them all out, old shoes and baking soda is not my ideal of taste! Lol. I chucked almost an entire fresh almond pulp (after making almond milk) batch of pancakes 2 days ago. I tried to use the pulp, the pancakes were inedible so I googled and tried to make them into muffins so I added some more baking soda. They smelled so delicious, but tasted like salt. Incredible salt muffins! I decided if I was going to cook this way I had to learn to accept the loss of food (which to me is like noooooo I paid MONEY for those ingredients!). There are some great recipes on Pinterest and the rest of the net for sweeter (read: covering up the papery taste) breads and some do add cinnamon and a sweetener like honey, agave or maple. Googling and experimenting is my new hobby but I promise you will get used to the major difference in taste. And start finding processed or very sweet foods undesirable. HA! Omg I feel so bad for you guys – fart bread & shoe cakes lol 🙁 I’m a huge fan of adding orange zest to baked goods. Really brightens the flavor. Best way to incorporate it is add it to the melted butter/oil and let it sit for a little bit. Spices would help too, depending on what flavor you like. A touch of molasses brings nice depth. You could also play with a tiny bit of almond extract and vanilla. A blend of almond flour & meal would be nice – the meal has more nutty flavor because of the skins. You could also try hazelnut flour. A note on baking soda…I find that a lot of GF recipes call for too much. I’m really sensitive to the taste. It’s a tricky calculation to figure out how much baking soda versus baking powder. Baking soda (even a conservative amount) without enough acid will not work properly and will taste funky. Adding apple cider vinegar to your liquids will help with this & create more rise. An almost identical version of this recipe is on Elana’s Pantry, the difference being that it calls for a bit of arrowroot flour. I make a savory version of this bread by adding minced garlic and a tablespoon of Italian Herb Seasoning. Delish! Almond meal is ground almonds with the skin on. Almond flour is blanched almonds without the skin ground into flour. It’s a bit different, but should probably work ok for this recipe with maybe a small change in texture. I followed the recipe exactly, but what came out of the oven is rather a brick than bread 😉 It didn’t rise at all, and is really heavy and dense- do you have an idea what could have gone wrong? On your pictures it looks sosoft, fluffy and crumbly! Sorry to say that, thats the life of wheat-free, and also, lots of eggs are needed but, you’ll find, you start not relying on bread, and will find other things to eat, cos yes, the ‘bread’ is so different. Only any good mostly for toasting, not sandwichs. Mine came out like a bric kand is about an inch and a half tall. Your reply implies that what to expect. Your picture is very misleading then. I just made a loaf and it also did not rise or brown. Were you able to figure out what went wrong with yours? Sorry, no, didn’t try it again so far. But I guess the problem is the type of almond flour I’m using. I had the same experience. An inch high brick. When the recipe says pour the batter into the pan, mine was more like a solid heavy dough. Surely four eggs is not enough fluid? Do you think replacing the whole eggs with egg whites (like those from a carton, like All Whites) would alter the baking cycle? In other words, would the bread not cook correctly unless I use whole eggs? No, it would not work. You need whole eggs. I wouldn’t suggest eating egg whites without yolks because most of the nutrients are in the yolk. The healthy fats in the yolk help you absorb the protein in the whites. What does the vinegar do for the recipe? I have all the ingredients except that. Can I substitute it for something else maybe? I went to a shop today but they didn’t have that kind. Can the cider vinegar be omitted? I have a vinegar intolerance and would prefer to leave it out. Heaven! just what I was looking for- a tad bit seedy and it has a hint of banana taste to it..but that could be that my taste buds associate flax w/banana. Maybe I’ll try the chi seed replacement mentioned. Small loaf but wonderful for someone who can’t have grains or yeast! I actually felt like I had bread with my soup for diner last night. A new staple in my kitchen! thank you!! Hi, i would like to prepare this bread but i dont have cider vinegar is it important to be added to the recipe? Hello! I am really excited about this recipe – but, can I roll these into a small ball and bake them that way rather than one loaf in a pan? I don’t really want a loaf – but I want to make sure that rolling them into balls isn’t going to destroy the recipe. For the folks asking if the vinegar is important, yes. But, you can substitute lemon juice if you can’t do vinegar. You need an acid to interact with the baking soda to get any rise at all….. Or you will, indeed, have a brick. there must be something missing in my copy as I made it exactly as shown using the exact ingredients and now after it’s cooled I just have a mass of crumbs, more or less looking just like before it was in the oven for 45 mins nothing brown or together. why does everyone but me have a perfect loaf?? I really enjoyed this bread. I used whole chia seeds to replace the flax seeds as I only had flax meal. I also added about a tablespoon of caraway seeds for a rye flavor. My bread was not tall enough for a traditional sandwich, so I ended up slicing it into 3 think sections, and then slicing each of those pieces into 4 toastable pieces. Delicious! I went grain and sugar free in November 2013 …. and have been experimenting since! Have had a few questionable results – but nothing a good smattering of fruit + cream, or home made tzatziki + salad won’t fix! It’s all edible … just shift your paradigm around wheat + yeast and the textures and smells of same. I’ve made this recipe three or four times ….. and didn’t bother with whole flax seeds, as I didn’t have any, so just added a little more ground seed to start with. My ground linseed (flax) is not golden – and gives a wonderful visual to the finished article. I whizz those 4 eggs till they’re light and fluffy – use double the soda and double the apple cider vinegar ….. Works a treat! Nice touch adding garlic and Italian herbs …. that will be the next version! I have made this bread several times, and it is so easy and delicious. I followed the advice and doubled the baking soda and vinegar each time. I also replaced one (sometimes two) of the eggs with unsweetened applesauce, with no ill effects. I have added oregano, garlic powder and shredded Parmesan for a savory bread, and cinnamon, cocoa, vanilla and dark chocolate chips for a dessert bread. Each time the result has been moist and delicious. I can live without the “rise” if the taste is good, and this one tastes good! This is my first attempt at Paleo bread and it was really good, especially with raw honey drizzled on it 🙂 I think I over measured my salt a bit because it was a tad salty, but the sweet honey helped to even that out. Thanks!! Yummy, I added bit of double cream yogurt, shredded carrot and sunflower seeds, left out honey, instead added half a teaspoon of xylitol, and voila, great bread! I am new to the Ketogenic Lifestyle and have been slowly incorporating new low carb food items that I have completely cut out for about a year. Bread is one of them. I came across this recipe and figured I’d give it a try since it came up in the15 Bread Recipes That Are Low-Carb and Gluten-Free article. I want to right reviews so new bees like myself can know what to expect etc. A lot of the bread recipes I read talked about “folding eggs” into the batter and reviews stated how difficult it was to have their bread rise properly. When I saw this recipe I knew it was going to me easier for my first attempt because it was not the traditional fluffy loaf of bread. Let me say though, it is still delicious!! It is a little more dense so perfect for some peanut butter and no sugar added jelly or some butter. I made grilled cheese and ham sandwiches out of it. Still turned out delicious. It’s important to remember this bread will not rise like typical bread. If you want the outside to be crunches like the article states you’ll need to cook it longer. If you double the recipe I would still use 2 loaf pans. Placing the dough in one may leave the center very gewey. I plan one trying to toast a slice in the oven and eat my eggs and bacon with it! Delicious and very easy to make!!!!! I really love this bread! I modified it to replace ground flax with brown rice flour because I read somewhere that you should never cook ground flax as it changes its chemistry and it is not good for you. I also baked it for only 40 mins in a glass loaf pan. Thank you for this delicious alternative to wheat bread! P.s. It is a short bread but tastes great! i can’t seem to find where it says what size pan to use. Can someone tell me? I’m anxious to try it! Sounds yum! Thanks for the recipe! I love it and it has been a staple of mine since going grain-free. My question is, how do you get the golden brown crust that appears in the pic and you talk about? I have followed the recipe to a tee and have never managed to get the crust. It is mostly the same consistency and flavor throughout. Thanks in advance. Hmm, I’m not sure, that’s just the way it came out for me. Glad you like it! Thank you so much for this recipe!!!! I have tried it a few times and twicked it a little bit. I add 1/4 cup of almond milk or half n half depending on what I have at hand just to lighten it and make it more moist. I also substitute the honey for sugar free syrup and also add 2 tablespoons of erytriol sweetner – delicious!!!! I have it the oven now, this time, this time I increased the sweetner to 1/8 of a cup because I have house guests who like sweet things. I cannot thank you enough for this recipe. I tried to make this bread and it was like sand. There was no consistency or density. What did I do wrong? Did you make any substitutions to the exact ingredients listed? Would this recipe work with peanut flour instead of almond flour? I’m not sure. I’ve never tried it with peanut flour. Let me know how it turns out if you try it! Hi! How long does the bread stay fresh? I only kept mine for a couple days. Keep it in the fridge for when you’re not using it. Wonderful! After a month of doing low carb I was dying for something besides meat and veggies- and this really satisfied the craving. I made it according to the directions except I didn’t have whole flax seeds so I just left them out. I also used a couple packets of splenda instead of honey. But wow it was good. Great flavor and texture- totally ticked all the boxes I needed. I put a little butter on top and it was such a treat. I can’t wait to share the recipe with my friends that are doing low carb as well. Can you use almond pulp instead of almond flour? I just made almond milk and have a lot of pulp that I would like to use in a bread. No that won’t work for this recipe. Thank you for sharing this wonderful recipe! It has been at least five days now, and I am still eating this, slice by slice, and loving it. It is wonderful to toast up. It has not gone hard as a brick as the days have gone by, even with my accidental omission of the acv. It probably just didn’t rise as much, as a result, since mine looks flatter than pictured. OK, so I am ready to make it again! I love the suggestions for making it savory – add garlic and herbs. Has anyone adapted this to add sweet flavors, such as banana, carrot or pumpkin? how many calories in this bread for a 1 inch thick slice? Anyone tried doing this with an egg substitute? is it any good? This bread is AMAZING on a keto diet! I found out the hard way that I really hate the taste of coconut flour in things so it was wonderful to discover this recipe using just almond flour. It stayed fresh for at least 3 days – by that time I had eaten it all! I just made this loaf and tried it warm, delicious!! Hi I just tried this recipe and loved it. I made a few small changes that I felt improved the flavor and texture. .do feel free to try them out. I used 3 whole eggs plus 2 egg whites, added 2 tablespoons of psyllium powder and added yeast just for flavor and pumpkin seeds. I also cut out the honey and acv. Thanks this was a great recipe. We’ve struggled with eggy yucky results but loved this ! I’ve made this bread 3 times now, I’m new to low carb. This is the best recipe I’ve found and I’m going to stop looking. The only ingredient I swap out is the honey, I use sugar free maple syrup instead. This bread has no eggy taste and is just delicious! I think the flax meal makes it exceptional! It also freezes well. Thank you for sharing. Looks like a terrific keto bread recipe – I like the addition of the flax. Thanks! Yea, the flax helps a lot with the texture! Flax is such a healthy ingredient. I use it a lot in my cooking, and this bread looks really interesting to try with it. Thanks for sharing! Thanks! Flax is great! 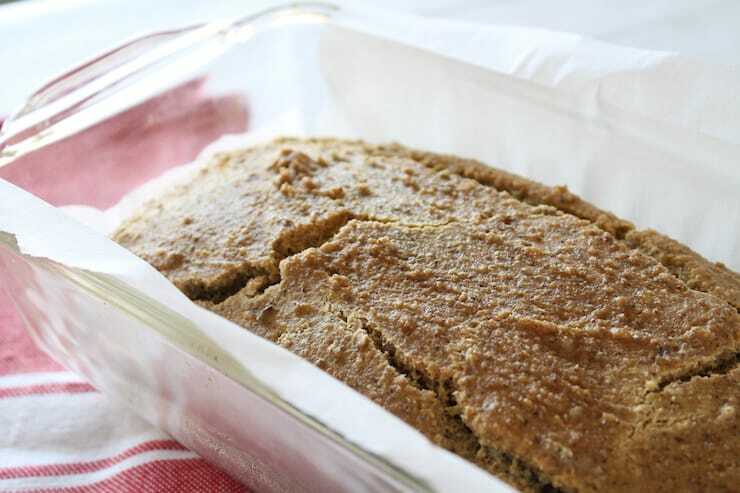 It’s such a great binder for grain-free baking too! This is fantastic for those starting and doing low carb! Looks great! This bread looks so delicious and perfect for breakfast! Such a great healthy idea for any time of the day! Thank you for sharing such a great Gluten Free Bread! This is close to one of our favorites! This actually is the best low carb bread I’ve make. And I’ve made a lot, most turn out like soggy bricks. This is a great texture and lovely taste. I used golden flax/linseeds . Perfect. I’m making another one this morning as the one from last night had nearly gone!!! Can this be done in a bread machine ? I’m not sure, I’ve never tried it in a bread machine. Let me know how it turns out if you try!